1. Has “the membership of the Catholic Church” in the United States “been declining” in recent decades? No it certainly has not. Membership represents the total population of persons who are Catholic (baptized and self-identifying as Catholic) and there has not been any decline in the membership of the Catholic Church in the United States since reliable data became available after World War II. Has immigration added to Catholic numbers in the United States? Yes; as it always has. 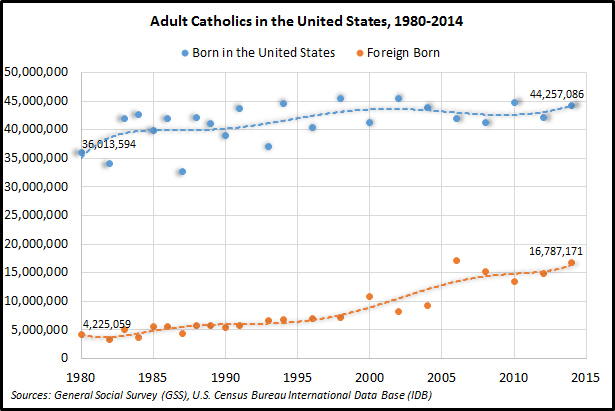 Not only does immigration increase the number of Catholics, it increases the numbers of many groups in the U.S. today and is a significant and growing force behind the country’s overall population growth as fertility rates have fallen below replacement levels. 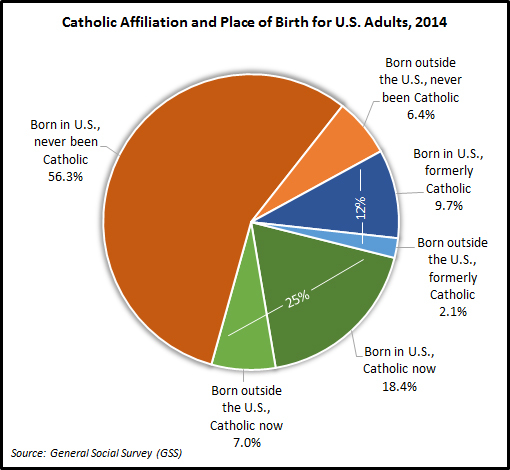 The figure below shows survey estimates from the General Social Survey (GSS) on the size of the adult Catholic population of the United States by place of birth. Fluctuations survey to survey are largely reflections of margin of error. However, the long-term trend line generally slopes up for both those born in the United States and those born elsewhere. Between 1944 and 1996, the Catholic Church in the United States baptized 54.8 million infants and children (representing adults in the U.S. today for which baptism data are available). The current size of the adult self-identified Catholic population in the U.S. is 61 million. In general, the Church’s baptism data are reflected in the memories of people who have been Catholic at some point in their life. As shown in the figure below, the baptisms celebrated in the Church between 1943 and 1960 represent 27% of all births in the U.S. during those years. 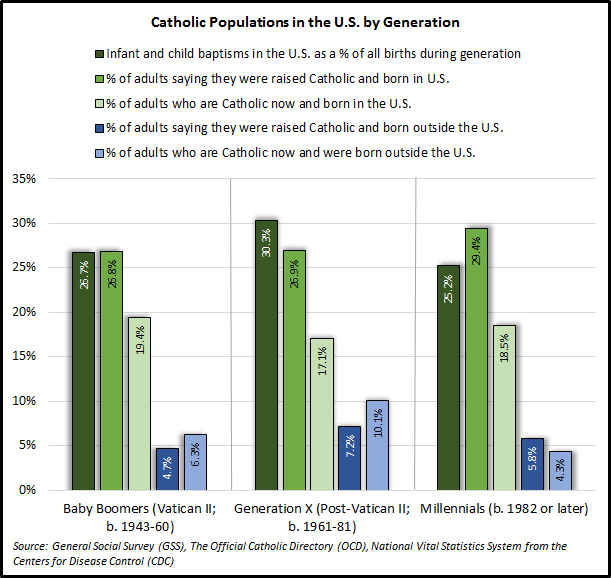 Twenty-seven percent of Baby Boomers born during those years recall being raised Catholic in the GSS. Today, 19 percent of the adult Baby Boomer population born in the U.S. of self-identifies as Catholic (representing a 72% retention rate among those raised Catholic during this period). Baptisms in the Generation X years (1961-81) reflect 30% of births during this period. Twenty-seven percent of Gen-Xers born in the U.S. say they were raised Catholic. Seventeen percent of Gen-Xers today self-identify as Catholic (representing a 64% retention rate among those raised Catholic during this period). What is a bit odd is that more adult Millennials born in the United States (1982 or later) recall being raised Catholic than the Church baptized during this period. Twenty-nine percent of native-born Millennials say they grew up Catholic but baptisms during this period represent only 25% of births. Currently, 19% of adult Millennials born in the U.S. say they self-identify as Catholic (representing a retention rate of 63%). The blue bars on the figure above represent the share of the foreign-born population who were raised Catholic and who self-identify as Catholic. Adding the lightest green color bar and the lightest blue color bar provides the total estimate for adult Catholic affiliation for each generation (19.4% + 6.3% = 25.7% Catholic among adult Baby Boomers). The pie chart below shows current and former Catholic populations by place of birth among all adults in the United States. What is often ignored in the discussion of Catholics who leave the faith is that immigration also is a source of these former Catholics. Twelve percent of adults are former Catholics and nearly one in five of this population (18%) were born outside the United States. In 1980, 22.6% of U.S. adults were born in the U.S. and Catholic, representing 36 million individuals. In 2014, 18.4% of U.S. adults were born in the U.S. and Catholic, representing 44.3 million individuals. Again, the population share declined but the total membership of this group increased by more than 8 million or by 22%. 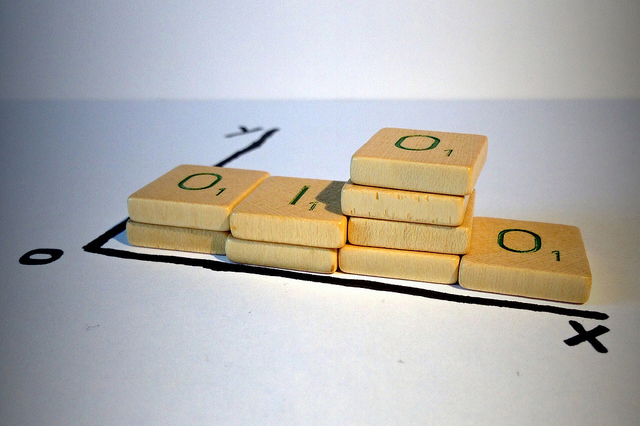 This is a rather simple mathematical reality that should have been observed in the news story. One other tidbit in the original news story was the notion that immigrants help “keep parishes across the country open.” Some Northeastern and Midwestern urban parishes have closed in recent years but this is more due to internal migration (to the suburbs and South and West; 1, 2, 3) as well as priest shortages rather than imaginary “declines” in the U.S. Catholic population. People move, buildings generally don’t. Closing parishes in areas with too few Catholics has made perfect sense. However, failing to open new ones where parishioners can’t find a parking spot will likely continue to be a problem for the Church in many other areas unless new construction picks up. 2. Will the Church experience a big jump in the number of priests ordained in 2015? Maybe? The reporter in this story was referencing CARA data collected for the USCCB. Bishop Michael F. Burbidge of Raleigh reacted to this research noting, “It is encouraging to see the slight increase in the number of ordinations this year in the United States.” Slight increase is an appropriate characterization. On the other hand, what appeared in The Washington Times and some other outlets lacked some important details and context. As explained in CARA’s report: “To obtain the names and contact information for these ordinands, the Center for Applied Research in the Apostolate (CARA) contacted all theologates and houses of formation in fall 2014 to request names and contact information for every seminarian who was scheduled to be ordained to the priesthood in 2015. CARA also requested names from the vocation director at all dioceses and archdioceses in the United States as well as the major superior of all U.S. based institutes of men religious.” This process led to “595 potential ordinands reported to CARA by theologates, houses of formation, arch/dioceses, and religious institutes.” CARA does this so it can then send a survey to the ordinands. When CARA conducted this study in the previous year, 477 potential ordinands were identified and reported to us. Thus, 118 more potential ordinands were identified in 2015 than in 2014 (i.e., a 25% increase). Potential ordinands and eventual actual ordinands are two different numbers. The research process can be affected by responses to CARA’s request for information each year. This year CARA, was a bit more “relentless” in its follow-up than usual as these data were also to be used in a major new study examining family influences on nurturing vocations. 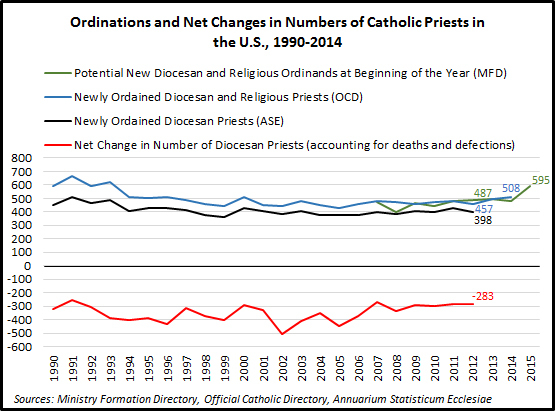 The figure below shows the trends in the number of potential ordinands identified by CARA in recent years along with the actual numbers of new ordinands as well as the net change in the number of diocesan priests each year with the addition of new priests and losses from deaths and men leaving the priesthood. Generally, the number of potential ordinands tracks with the number of priests ordained but there is some volatility year to year. It is possible that 2015 will end up like 2008 and be more off the mark than other years. Between 2001 and 2013 the Church in the U.S. has ordained fewer than 500 priests in any given year. In 2014 it passed this mark and is likely to do so again in 2015 but we cannot be sure just how much above 500 this will end up being. That is good news. The bad news is in the red line (...as we’ve noted before) Five hundred is still not enough to make up for the losses each year due for the most part to mortality. Only 8% of losses in 2012 were due to priest defections (59 of 740 diocesan priests lost). The Catholic Church needs about 700 to 800 ordinations of diocesan priests a year to stem the decline in the total number of these clergy. In 2012, the Church ordained 398 diocesan priests (along with 59 religious priests). If the Church ordains 595 diocesan and religious priests in 2015 that would indeed be a significant uptick but still insufficient in the broader context. We can also see the potential numbers of new priests in the years ahead in seminary enrollments. The next two figures are from data in CARA’s Ministry Formation Directory. 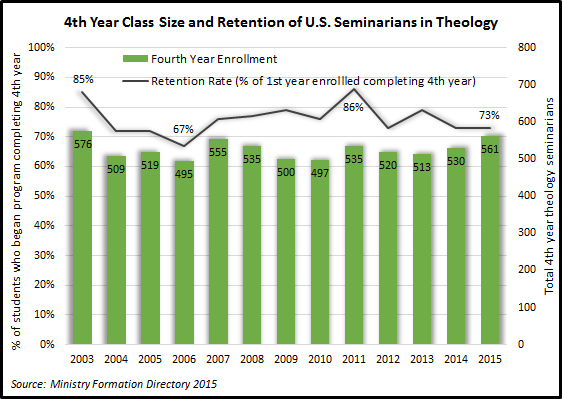 It documents the relatively steady numbers of those studying to become priests in U.S. seminaries. Currently there are 5,454 of these men and teens enrolled from high school seminaries to post-baccalaureate theologates. 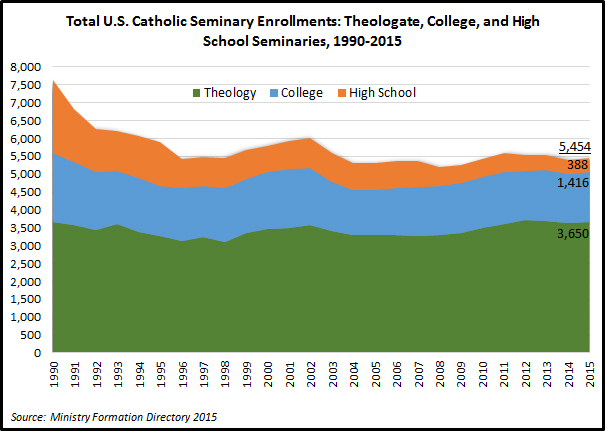 The second figure, showing fourth year theologate enrollments, is more important for predicting how many priests might be ordained in the near future. These numbers have been quite steady in the last decade and retention has averaged 76% during this period (i.e., about three in four of those who enter as first-year students are enrolled in the fourth year). Currently there are 591 seminarians in their third year followed by 654 in their second year, and 661 in their first year (see page 16). Each of these class sizes will be smaller before they reach their fourth year. For example, the 561 seminarians in their fourth year in 2015 numbered 596 in their third year, 706 in the second year, and 768 in their first year. Until we see the final numbers on those who are ordained it is safest to stick with Bishop Burbidge’s observation of a potential “slight increase.” A trend isn’t evident until you have a series of moving observations. It is possible 2014 and 2015 may be the beginning of a very positive trend for the Church but we won’t really know until we get a third observation in 2016. Even then the Church would still have a sizable deficit to overcome before it reaches a more ideal number of ordinations on the order of 700 to 800 per year to establish stability in the diocesan priest population in the United States. In conclusion…. Reading these two news stories, people may have been left with the impression that the future will include fewer Catholics and more priests. Both of these notions are, for now, incorrect. Data image courtesy of janneke staaks.